Johnny Depp is an American television and movie actor . He arguably became a star with his role on the television series 21 Jump Street and transformed into a leading Hollywood actor through his title role in Tim Burton’s film Edward Scissorhands. Johnny Depp has been nominated for numerous Golden Globe, SAG, and Academy Awards. In 2003, he won the Screen Actors Guild Award for Outstanding Performance by a Male Actor in a Leading Role for his role as Captain Jack Sparrow in Pirates of the Caribbean: The Curse of the Black Pearl. 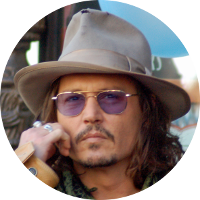 Although there are a number of online websites that claim royal or famous connections for Johnny Depp, these have not been verified as to their accuracy and in some cases are somewhat doubtful. One ancestor of Johnny Depp’s that does appear accurate is that of his 8th great-grandmother Elizabeth Key. Elizabeth Key was a Virginia slave born to an English father and an African-American mother. She sued for her freedom and won on July 21, 1656. During the lawsuit, she apparently fell in love with and married her lawyer William Grinstead. She is said to be the first female African-American slave to have won her freedom in court.